As it is stated in the previous verse, a person who has once offenselessly chanted the holy name of God becomes immediately eligible to perform Vedic sacrifices. One should not be astonished by this statement of Śrīmad-Bhāgavatam. 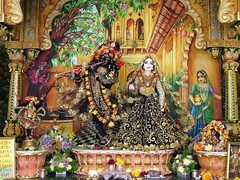 One should not disbelieve or think, “How by chanting the holy name of the Lord can one become a holy man to be compared to the most elevated brāhmaṇa?” To eradicate such doubts in the minds of unbelievers, this verse affirms that the stage of chanting of the holy name of the Lord is not sudden, but that the chanters have already performed all kinds of Vedic rituals and sacrifices. It is not very astounding, for no one in this life can chant the holy name of the Lord unless he has passed all lower stages, such as performing the Vedic ritualistic sacrifices, studying the Vedas and practicing good behavior like that of the Āryans. All this must first have been done. 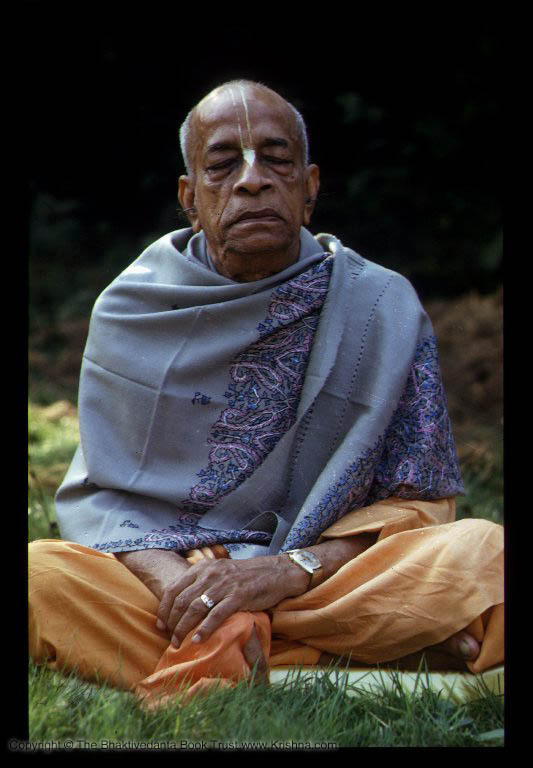 Just as a student in a law class is to be understood to have already graduated from general education, anyone who is engaged in the chanting of the holy name of the Lord—Hare Kṛṣṇa, Hare Kṛṣṇa, Kṛṣṇa Kṛṣṇa, Hare Hare/ Hare Rāma, Hare Rāma, Rāma Rāma, Hare Hare—must have already passed all lower stages. The offenseless chanting of the holy name does not depend on the initiation process. 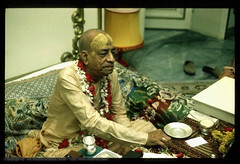 Although initiation may depend on puraścaryā or puraścaraṇa, the actual chanting of the holy name does not depend on puraścaryā-vidhi, or the regulative principles. 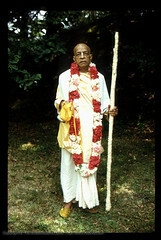 If one chants the holy name even once without committing an offense, he attains all success. 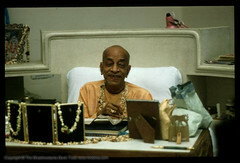 The holy name has to be chanted to please the Supreme Lord, and not for any sense gratification or professional purpose. If this pure mentality is there, then even though a person is born of a low family, such as a dog-eater’s, he is so glorious that not only has he purified himself, but he is quite competent to deliver others. He is competent to speak on the importance of the transcendental name, just as Ṭhākura Haridāsa did. He was apparently born in a family of Muhammadans, but because he was chanting the holy name of the Supreme Lord offenselessly, Lord Caitanya empowered him to become the authority, or ācārya, of spreading the name. It did not matter that he was born in a family which was not following the Vedic rules and regulations. Caitanya Mahāprabhu and Advaita Prabhu accepted him as an authority because he was offenselessly chanting the name of the Lord. Another point established in this verse is that meditation should be carried on with the chanting of a mantra. Chanting of the Hare Kṛṣṇa mantra is the easiest process of meditation in this age. As soon as one chants the Hare Kṛṣṇa mantra, he sees the forms of Kṛṣṇa, Rāma and Their energies, and that is the perfect stage of trance. One should not artificially try to see the form of the Lord while chanting Hare Kṛṣṇa, but when the chanting is performed offenselessly the Lord will automatically reveal Himself to the view of the chanter. The chanter, therefore, has to concentrate on hearing the vibration, and without extra endeavor on his part, the Lord will automatically appear. 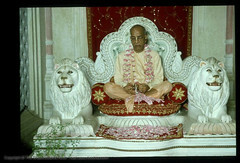 Whether a Vaiṣṇava is properly initiated or not is not a subject for consideration. One may be initiated and yet contaminated by the Māyāvāda philosophy, but a person who chants the holy name of the Lord offenselessly will not be so contaminated. A properly initiated Vaiṣṇava may be imperfect, but one who chants the holy name of the Lord offenselessly is all-perfect. Although he may apparently be a neophyte, he still has to be considered a pure, unalloyed Vaiṣṇava. It is the duty of the householder to offer respects to such an unalloyed Vaiṣṇava. This is Śrī Caitanya Mahāprabhu’s instruction. Those who find fault in the Western Vaiṣṇavas should consider this statement from Śrīmad-Bhāgavatam and the commentary on this verse by Śrīla Jīva Gosvāmī. In this regard, Śrīla Jīva Gosvāmī has stated that to become a brāhmaṇa one has to wait for purification and undergo the sacred thread ceremony, but a chanter of the holy name does not have to wait for the sacred thread ceremony. We do not allow devotees to perform sacrifices until they are properly initiated in the sacred thread ceremony. Yet according to this verse, an offenseless chanter of the holy name is already fit to perform a fire ceremony, even though he is not doubly initiated by the sacred thread ceremony. This is the verdict given by Devahūti, the mother of Lord Kapiladeva, when He was instructing her in pure Sāṅkhya philosophy. Ajāmila begot in the womb of the prostitute ten sons, the last of whom was called Nārāyaṇa. At the time of Ajāmila’s death, when the order carriers of Yamarāja came to take him, he loudly called the name Nārāyaṇa in fear because he was attached to his youngest son. Thus he remembered the original Nārāyaṇa, Lord Viṣṇu. Although he did not chant the holy name of Nārāyaṇa completely offenselessly, it acted nevertheless. As soon as he chanted the holy name of Nārāyaṇa, the order carriers of Lord Viṣṇu immediately appeared on the scene. A discussion ensued between the order carriers of Lord Viṣṇu and those of Yamarāja, and by hearing that discussion Ajāmila was liberated. He could then understand the bad effect of fruitive activities and could also understand how exalted is the process of devotional service. Previously, when engaged in sinful activities to maintain his family, Ajāmila chanted the name of Nārāyaṇa without offenses. To chant the holy name of the Lord just to counteract one’s sinful activities, or to commit sinful activities on the strength of chanting the holy name, is offensive (nāmno balād yasya hi pāpa-buddhiḥ). But although Ajāmila engaged in sinful activities, he never chanted the holy name of Nārāyaṇa to counteract them; he simply chanted the name Nārāyaṇa to call his son. Therefore his chanting was effective. Because of chanting the holy name of Nārāyaṇa in this way, he had already vanquished the accumulated sinful reactions of many, many lives. In the beginning he was pure, but although he later committed many sinful acts, he was offenseless because he did not chant the holy name of Nārāyaṇa to counteract them. One who always chants the holy name of the Lord without offenses is always pure. As confirmed in this verse Ajāmila was already sinless, and because he chanted the name of Nārāyaṇa he remained sinless. It did not matter that he was calling his son; the name itself was effective. The transcendental potency of the Hare Kṛṣṇa mahā-mantra is herein explained. First, the holy name is vibrated by Śrī Caitanya Mahāprabhu. When someone hears from Him directly, he is purified. When another person hears from that person, he also is purified. In this way the purification process is advanced among pure devotees. Śrī Caitanya Mahāprabhu is the Supreme Personality of Godhead, and no one can claim His potency. Nonetheless, if one is a pure devotee, hundreds and thousands of men can be purified by his vibration. This potency is within every living being, provided he chants the Hare Kṛṣṇa mahā-mantra offenselessly and without material motives. When a pure devotee chants offenselessly, another person will become a Vaiṣṇava, and from him another Vaiṣṇava will emerge. This is the paramparā system.